PNG Government is getting ready for implementation of REDD+ under the UNFCCC and Paris Agreement 2016. In preparation PNG needs to setup a ‘Grievance Redress Mechanism’ - a system designed and established by national government agencies to receive and address complaints about the impact of REDD+ related policies, programs and activities. Last week more than 29 representatives of key government agencies, community and NGO leaders came together in Port Moresby to discuss how to setup this Grievance Redress Mechanism. UNDP REDD+ advisor Mirzohaydar Isoev said the goal of the meeting was to identify the best channels for community feedback. “Having some kind of effective feedback system in place is important for the PNG Government because it enables them to listen to the voices of the people and respond appropriately to help resolve issues that arise. This system needs to be easily accessible with a transparent and fair process”. TheCCDA and PNG forestry Authority are leading the development of REDD+ in PNG with the support of UNDP, Forest Carbon Partnership Facility and other partners. Sonia Baine a, CCDA officer stressed the importance of having this discussion as the first step towards developing a Grievance Redress Mechanism. A number of potential options for how a Grievance Redress Mechanism will work in PNG are expected by April 2017 and will form an important part of PNG’s National REDD+ strategy the main document used to guide all REDD+ actions in PNG. 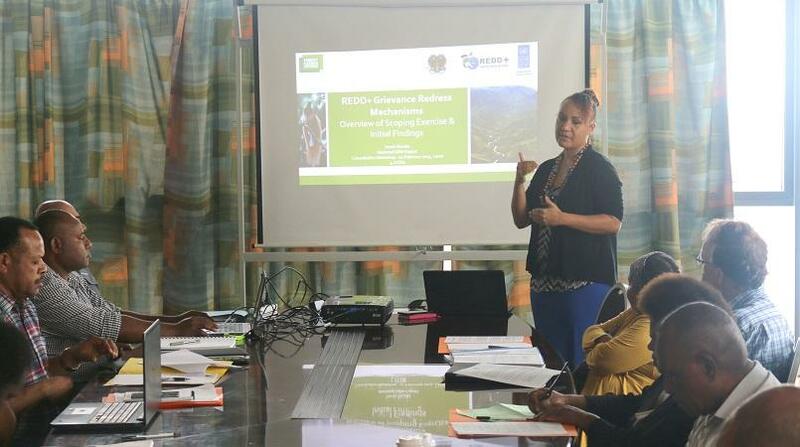 REDD+ is an integral part of PNG Government’s efforts to address climate change and provide PNG with opportunities to protect, conserve and manage its forests in a more environmentally sustainable way.